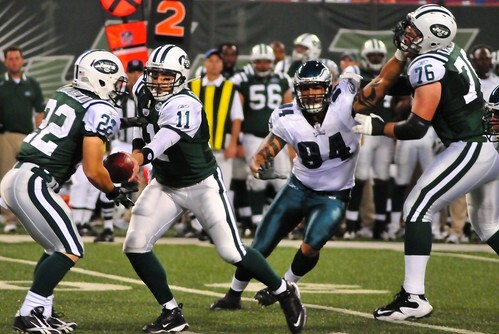 Note: this photo was published in an Oct 13, 2010 blog titled "What You Can Learn From NFL Stars." It was also published in an undated (mid-Nov 2010) blog titled "Online Football Shirt Options." And it was published in a Dec 26, 2010 blog titled "3 Online Dating Tips For Newbies And Beginners." Moving into 2011, the photo was published in a Jan 16, 2011 blog titled "Where can I find a free online dating site?" It was also published in an undated (early Apr 2011) Online Gaming blog, with the same caption and detailed notes that I had written on this Flickr page. And it was published in an Apr 8, 2011 Cool Play Free Football Games Online images blog, with the same caption and detailed notes that I had written on this Flickr page. The other problem is that I know little or nothing about the nuances of football, beyond the obvious fact that the quarterback either passes the ball, or hands off to someone who attempts to run the ball downfield. Punts and field-goal kicks are also a familiar concept, but if you don’t have a good anticipatory sense of who is about to do what to whom, it’s easy to miss the "moment" when the perfect shot might be available. Also, I didn’t really know anything about the players, aside from the respective star quarterbacks: Philadelphia’s controversial Michael Vick, and New York’s newly-named starting quarterback, Mark Sanchez. I had looked at the team rosters on the Internet before the game, so at least I knew their jersey numbers (#6 for Sanchez, and #7 for Vick, as you’ll see in the photos) — but the "action" was often so far away (at the other end of the field) that I couldn’t tell whether the starting quarterback, or one of the substitutes, was making the plays. Nevertheless, by the beginning of the second quarter I was feeling a little more comfortable — if only because I found it easy to follow along behind the other professional photographers as they marched (or ran) from one end of the field to the other, in order to get their equipment set up for what they expected would be the next great shot. By the end of the game, I had taken 1,100+ photos, including several of Michael Vick in a post-game locker-room interview; and from the sound of the clickety-click-clack of my fellow photographers, I could tell that many of them had taken several thousand. I’ll spare you the technical details of my feeble attempts to get some decent shots; I had picked up some good tips from the sports-photography chapter of Scott Kelby’s Digital Photography, and I did my best within the limitations of my equipment and my lack of familiarity with the situation. What impressed me most about the whole experience was the scale of modern professional football — the scale of everything. It’s one thing to read that there are 80,000 people in a football stadium; it’s another thing to actually be there and hear the simultaneous roar of those 80,000 people as a quarterback is sacked or a long pass is completed. It’s one thing to read that a professional football player is 6 feet, 5 inches tall and weighs 350 pounds; it’s another thing to stand next to several dozen such giants. Heck, I thought there were only 20 or 30 such giants on each team; I had no idea that there were 64 of them (a number which will be pared down as the pre-season comes to an end), or that there might be 20-30 different coaches. And then there are the hundreds of "staff members" scurrying around all over the place, carrying out their various duties and assignments; and there are the security guards and State Police, who spent most of the time scanning the stadium crowd rather than watching the players, presumably watching for scuffles or fights or … well, who knows what. There are cheerleaders too, in this case bearing the official name of New York Jets Flight Crew; I had expected half a dozen, but there were two dozen perky, long-haired beauties, with permanently frozen smiles, who who danced and pranced before the crowd at every conceivable opportunity. … and, yes, I probably will attend another football game or two in the years ahead. Whether I’m lucky enough to get down on the field again is anyone’s guess….